The Dodgers grabbed a few interesting prospects — powerful, athletic, versatile — in Rounds 21-30, headlined by a catcher, first baseman and 3-sport high school standout. Keep in mind, the odds of any of the following players developing into even fringe-average MLB players is slim. But there are some things to like about these guys. At least, among the infornation I could find. If he can regain any of that throwing arm strength, he could be an interesting project behind the plate. Being athletic enough to also handle the outfield is a plus in his column. Oh, and the plus-raw power is never a bad thing. He has the option to go back to school for his senior season, which could improve his draft stock in terms of the round he’s chosen, but he might not actually make much more than what the Dodgers might offer him. 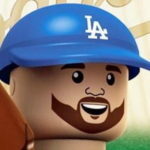 A large human being, Simon is a true right-right first baseman who doesn’t really have the speed, agility or quickness to play anywhere else on the diamond. He was the last player Baseball America ranked in its Top 500 draft prospects. The Dodgers traded a right-right first baseman with double-plus raw power earlier in the season (Ibandel Isabel), so it seems they’re just trying to fill that “need.” Here’s what Billy Gasparino told Dodger Insider about the selection. He’s the mirror image of Isabel. You can quote me on that. He should be signable in the 22nd round, but he does have a commitment to the University of Houston. If he doesn’t get what he wants, he could end up with the Cougars. Hagenman is the first Nittany Lion the Dodgers have ever drafted. He didn’t rank in the BA Top 500, but BA did rank him as the 26th-best prospect (out of 32) in the state of Pennsylvania. He started 14 games for Penn State and had a 4.60 ERA while striking out nearly a batter per inning. The best velocity reading I could find on him was from 2014, when he touched 88 MPH on the radar gun. With his strikeout rate, it’s probably safe to assume he improved the velo — even if only slightly. One of five high school players the Dodgers drafted after the fourth round, Roberson is from local(ish) Bakersfield and has an athletic profile. He might be the most athletic player the Dodgers drafted this week. BA ranked him at No. 237 in its Top 500. And here’s a highlight of him playing handegg. There’s also the slight possibility he could test his skills on the mound if the outfield doesn’t work out. This is from Team One Baseball. He’s extremely raw and it woudn’t be surprising to see him get to campus. But he’d also be an interesting project for Brandon Gomes and the player development department, if for no other reason than he’s toolsy and young. If the Dodgers go over the $125,000 mark, it might be for a guy like Roberson. William Carey University? Hunter Speer? This might be the easiest sign of the entire draft class. He didn’t make any top lists and is a redshirt senior. This pick screams “org depth.” But at least his name is pretty wicked. Oh, and he has fabulous hair, as you can see in this video. It looks like he went to what is similar to Driveline baseball and improved his velocity from 88 MPH to 94 MPH. It remains to be seen if it holds there or dips back down (as it does sometimes), but at least there’s some potential with a fastball that touches the mid-90s. Yesss, give me all the catchers. Ackerman is a big dude,but he wasn’t one of the Top 500 BA draft prospects, nor did he make a state-specific list. In his only season with Illinois-Chicago, he hit .295/.360/.464 with 5 home runs in 186 plate appearances. Here’s the only scouting note I could find on him. And here’s a video from three years ago. I’m sure not a ton has changed, but it’s hard to draw any definitive conclusion from a video of a kid in high school who went to college for three years. One thing I dig is a left-handed hitting catcher. The only thing I dig more is a switch-hitting catcher, and Ackerman is just that. The Dodgers should sign him for that fact alone. He has another year of eligibility, and it seems like a coin flip whether he’ll sign or go back to school. Mitchell has a good frame. If he were a high school draftee, he’d be labeled as “projectable.” But because he’s from a 4-year school, he’s probably physically maxed out. In 68 2/3 inning with the Bulldogs this season, Mitchell pitched to a 4.85 ERA, but had a solid 4.2 K/BB ratio. Like some other guys drafted in this range, there isn’t a lot of information out there about him. So, here’s a video from when he pitched in high school, for all the good it’ll do. He has one more year of eligibility, if he chooses to go back to school. He’d be a nice guy to have if for no other reason than he throws left-handed and has the potential to miss bats. Finally! I was wondering when we were going to not only get to another guy who has been through Tommy John surgery, but also the best name in the draft class. Seriously, this is an 80-grade name tool. He missed the 2016 campaign recovering from the procedure. In 2018, he pitched mostly out of the bullpen for the Cowboys. He had a 4.47 ERA and a not-great 6.4 K/9. It looks even worse when you put it up against his 5.0 BB/9. Here’s another 5-year-old video because, well, no one really scouted this kid. Here’s an interesting note — possibly just interesting to me — but his brother Hamed is a staff writer for the San Francisco Chronicle. Yay journalism! More interesting for you, he attended Yavapai College in Arizona … the same college Willie Calhoun attended a few years ago. Robinson is an athletic lefty-lefty outfielder who played well for the Central Michigan Chippewas. He hit .292/.397/.406 with a sparkling BB/K ratio (1.65). He’s not a power hitter by any means and is a bit of a throwback player. He wasn’t ranked in either BA Top 500 or its state rankings. Here’s a good piece on him by Evan Petzold, who also does some work for the Loons, about his rebounding from a slow start. And now, prepare to have your mind blown because there is recent video of Mr. Robinson. His stance and swing seem a bit stiff. For a guy with a solid athletic frame, you’d think he’d be a little more loose at the dish. It wouldn’t be surprising to see him go back to school to try to improve his draft stock. But like Roberson, he’d be another athlete the Dodgers would love to get into their system. Interesting tidbit: He attended Grosse Pointe North High School, which was the alma mater of John Cusak’s character in the film Gross Pointe Blank. I wasn’t able to 100 percent confirm this, but the circumstantial evidence is overwhelming. The captain of the Belmont baseball team, Cogen had a fantastic season for the Bruins. He hit .372/.418/.586 with 28 extra base hits in 263 plate appearances. He also had a near-1:1 BB/K ratio. As a senior, he should be a rather easy sign for the Dodgers. He reminds me a bit of Kyle Garlick in terms of profile, and the Dodgers have done a good job making Garlick’s name at least known by the sickest of prospectors (like myself). If it sounds like I’m trying to fill space, you’re right. There’s no usable information about Cogen on the Internet. There’s not even a 5-year-old video I can embed. For now, just enjoy Belmont’s tweet that announced Cogen was drafted by LA.